Seit vergangenem Herbst wirbt die Bundeswehr mit Internet-Clips um Nachwuchs. Im Gespräch ist sie derzeit aber viel mehr wegen brauner Kameraden. Was hat die große und teure Image-Kampagne gebracht? Sind die Nachwuchssorgen der Truppe passé? Knappe Konserven – Wie steht es um die Blutvorräte? Im September 2016 warnte das Deutsche Rote Kreuz (DRK): Der Vorrat an Blutspenden sei fast überall in Deutschland aufgebraucht, die Notfallversorgung in Gefahr. Die Gründe für den Engpass: Sommerferien, Fußball-EM, OIympische Spiele – und die Rekordhitze im September. Wie ist die Lage heute, ein halbes Jahr später? Lehrerproteste in Mexiko – Was geschah in Oaxaca? Am 19. Juni 2016 eskalieren in Mexiko die Proteste der Lehrergewerkschaft gegen eine Bildunsgreform. Es gibt Tote und Verletzte. Wie ging es weiter? Seit April 2016 lebt ein Bienenvolk im Zentrum der Macht. Wir haben mal nachgefragt, ob dort für die emsigen Insekten was zu holen war. Jobwunder in Köln? – Was bewirkte die Plakataktion „1.000 freie Stellen“? Seit Mitte März 2016 sucht die Stadt Köln mit einer Werbekampagne händeringend Personal. Ein halbes Jahr später fragen wir nach dem aktuellen Stand: Was hat die Werbeaktion gebracht? Germanwings-Absturz – welche Konsequenzen ziehen Politik und Airlines? Im März 2016 legten die Ermittler der französischen Flugsicherheitsbehörde BEA ihren Abschlussbericht zum Germanwings-Absturz vor. Sechs Monate danach fragen wir: Inwieweit sind die Empfehlungen der Experten in das Gesetz eingeflossen? Und was hat sich bei den Airlines geändert? Die Zuwanderung von Flüchtlingen nach Deutschland, der Terrorangriff in Paris am 13. November 2015, die Übergriffe in der Silvesternacht in Köln und anderen Großstädten – all diese Ereignisse verunsichern die Bevölkerung. Manche sind offenbar so verängstigt, dass sie zu Waffen greifen, um sich gegen vermeintliche oder tatsächliche Gefahren zu schützen. Insbesondere in den Tagen und Wochen nach Silvester haben sehr viele Menschen den Kleinen Waffenschein beantragt. Köln stand damals besonders im Fokus der öffentlichen Aufmerksamkeit. Wie viele Anträge auf den Kleinen Waffenschein gab es dort seit Jahresbeginn? Und wie ist die Situation in Deutschland? Seit dem 19. Januar 2016 ist Peter Füssenich neuer Leiter der Dombauhütte in Köln. 6 Monate später stellt Follow Up ihm 3 Fragen. Am 10. Dezember 2015 trat das „Gesetz zur Strafbarkeit der geschäftsmäßigen Förderung der Selbsttötung“ in Kraft. Der neu eingeführte § 217 des StGB richtet sich vor allem gegen Sterbehilfevereinigungen wie „Sterbehilfe Deutschland“ oder „Dignitas“, die ihren Mitgliedern Freitodbegleitung anbieten. Das Gesetz soll verhindern, dass Sterbehilfe zum Regelangebot ärztlicher Leistungen wird. Ein halbes Jahr nach Inkrafttreten des Gesetzes sprach Follow Up mit Prof. Dr. Eberhard Schockenhoff, Moraltheologe an der Universität Freiburg und Mitglied des Deutschen Ethikrates, über die neue Regelung. Blumberg, rund 20 Kilometer nordöstlich von Berlin, am 16. Dezember 2015. Bundesinnenminister Thomas de Maizière und Bundespolizeipräsident Dieter Romann präsentieren der Öffentlichkeit eine neue Eliteeinheit der Bundespolizei: die Beweissicherungs- und Festnahmeeinheit plus, kurz BFE+. Sie soll künftig vor allem bei Anti-Terror-Einsätzen und länger andauernden Fahndungen zum Einsatz kommen. Am Tag der medienwirksamen Präsentation nehmen die ersten 50 Beamten der neuen Einheit ihren Dienst auf, in mehreren Phasen sollen weitere 200 hinzukommen. Follow Up fasst nach: Ist die Einheit mittlerweile einsatzbereit und gerüstet für ihre Aufgaben? Und braucht es die neue Einheit überhaupt? Iraq, November 2015. It has already been two months since cholera broke out in the Bagdad region. Speaking with news agency Reuters, Peter Hawkins, UNICEF’s Iraq director, expresses his fear that the infectious disease might spread to neighboring countries such as Kuwait and Bahrain. 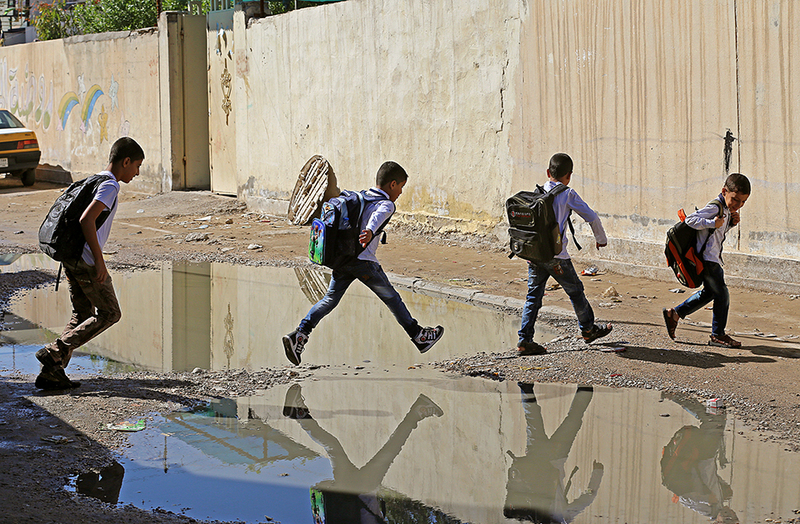 Six months later Follow Up talks with Jeffrey Bates, Chief Communications Officer at UNICEF Iraq, about the reasons for these concerns. We also asked him what UNICEF did to prevent cholera from spreading further into the crisis-shaken region. 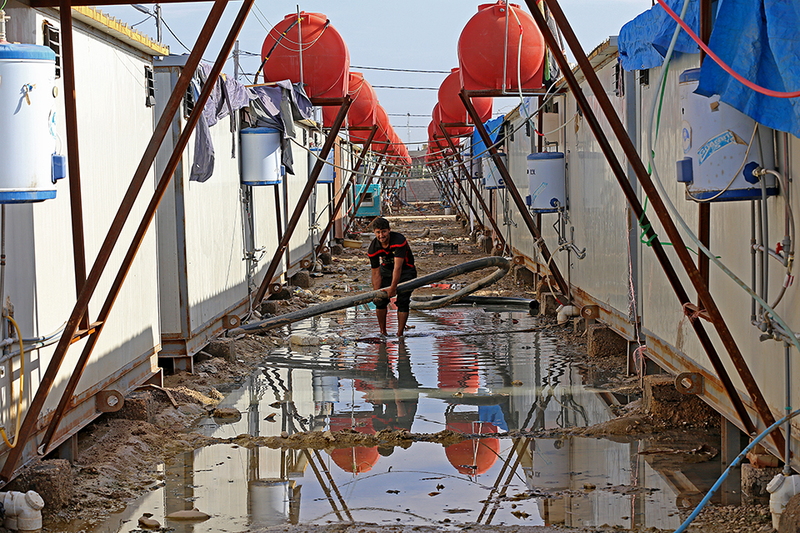 What were the consequences of the cholera outbreak that happened in Iraq last year? We ended up with a total 3,000 cases confirmed in the national laboratory but there were only two confirmed deaths. So, all in all, the mortality rate for this outbreak was much lower than you would have anticipated given the number of confirmed cases. Was this due to the measures that UNICEF took? What did you do to mitigate the risks of the cholera outbreak? There were a number of measures put in place within 48 hours in collaboration with agencies such as the World Health Organization and the ministries of health who had convened a cholera task force. UNICEF focused on improving water sanitation systems and providing supplies such as oral rehydration solutions and salts. We also started a mass communication campaign which helped people understand how cholera is transmitted, mechanisms for prevention, but also, early danger sign recognition. With medical interventions, such as drips, you can reduce mortality rates from sometimes up to 30% to about 1% – 2%, so it was important for people to know symptoms so they could get treatment. Did the cholera outbreak last year come as a surprise? No, it was anticipated. Iraq is a cholera endemic country with outbreaks happing about every three to four years. It is not known really why cholera outbreaks follow this pattern here, but most diseases do have predictable times or cycles when we expect more cases. Because the previous outbreak was in 2012, and the one before that in 2007, if we did not see cholera this year, it probably would have happened the next year. Can you describe the typical course of the disease? Cholera typically starts in September, peaks in October/November, and then trails out in December. And that’s exactly the epidemiological curve that we saw from last year’s outbreak. So in November, we were at the peak of the epidemic when the most people were likely at any one time to have been exposed and thus have the cholera bacteria in their gut. One of the additional risks for the cholera to spread to neighbouring countries was Arbaeen, the Shia Muslim religious observance. There are about ten million people from different countries coming to Kerbala, south of Bagdad, every year. The fear was that we were going to see a huge bump in the number of cases both in Iraq, but also in source countries if people carried the cholera bacteria home. But actually, we didn’t. Exact numbers are always difficult to measure but some people estimated up to 20 million came during Arbaeen. In anticipation of this pilgrimage, we put into place a lot of mitigation activities, such as mass public information messaging, a lot of key water sanitation facilities ensuring that the water people received was clean, that they had access to medical facilities. The result was that a huge number of people converged in Kerbala and left without really impacting or seeing a dramatic increase in cholera rates. So was your fear unjustified? The precautions were necessary as the consequences were potentially disastrous. Further, in this region, we have a lot of travel in and around the country – people travel for economic reasons, as refugees, to visit relatives. So this fear that the cholera could spread – and it did end up spreading to some neighboring countries – was very real. Fortunately, we didn’t see wide scale spreading, and the outbreak overall was smaller than previous outbreaks. How do you monitor the course of an outbreak? There are several ways that we do what we call “surveillance”. The primary health services in the village would record how many people come in with acute watery diarrhea, the main cholera symptom. There are normal expected incidence rates, which will increase during a cholera epidemic. If someone exhibits the signs, then you would count it as a likely cholera case. But the only way you can say for sure is if you get a laboratory confirmation. We have laboratories in Iraq at the governorate level, and there are 18 governments. They will send some samples to the national laboratory to verify them. So the ultimate verification is the national level laboratory because it has the highest control standards. Are these laboratories working well, considering the unstable political situation in Iraq? In Iraq we have a wide scale security crisis. In certain areas these laboratories might not be fully functional so surveillance results might not be accurate. So we can’t say for sure, particularly in areas that aren’t under government control, what was happening with the outbreak. We can only say for sure the numbers of cases in areas that we had access to laboratories, or could verify through laboratory confirmation. The precautions were necessary as the consequences were potentially disastrous. What role does money play for your work? Money plays a very pivotal role because all of UNICEF’s activities have expenses related to them. Iraq is typically thought of as a middle to high-income country because of its oil exports. But the ongoing crisis and the conflict in Iraq have drained a lot from the economy. Also the lowering oil prices on the global economic market have really crippled the ability of the national government and regional governments to invest in these types of social activities. 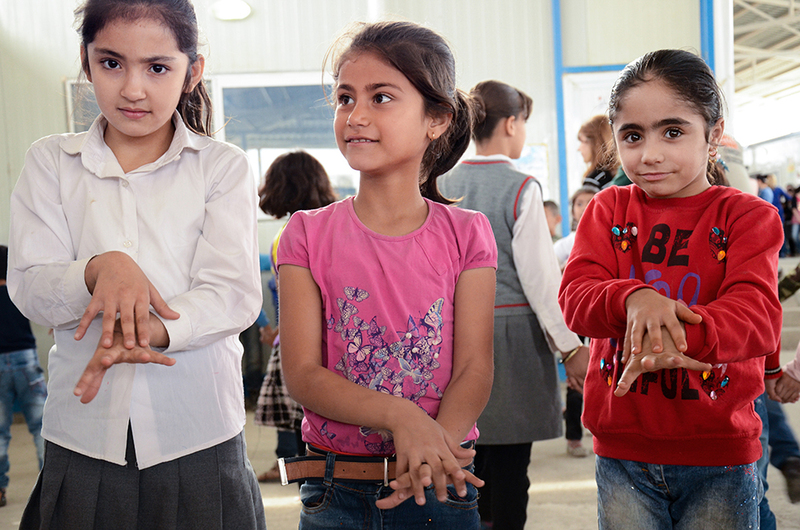 Where do UNICEF’s resources come from? For UNICEF, and the other UN agencies, we rely on donors to provide funding. The scope and the scale of what we’re facing requires immense investments. We just recently put out a call for over $500 million for the entire UN humanitarian response of which we’ve only so far gotten about 16% funded. Some of our major donors are the United States, the government of Germany, the government of Japan and the government of the United Kingdom. We have over 30 individual donors but these are some of our biggest ones. We also get funding from foundations or from private industry and civil society. However, their funding usually can’t reach the levels that governments can provide. 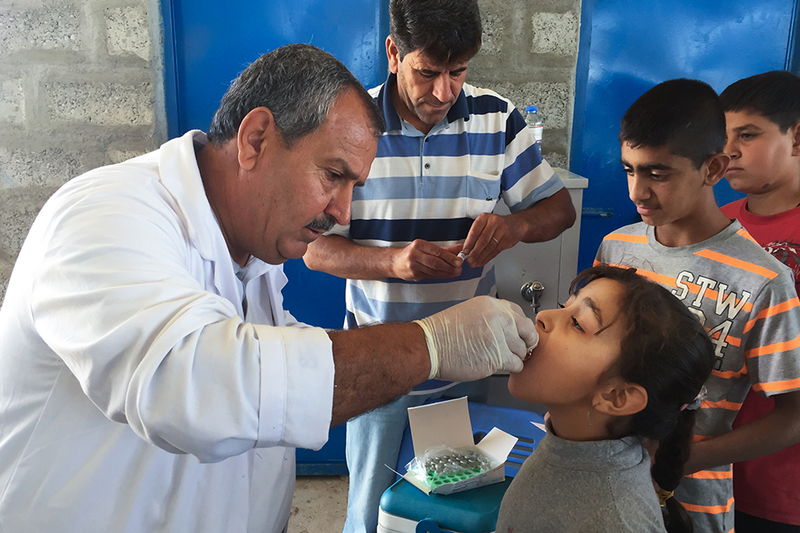 What is the health situation like in Iraq right now? Cholera really is no longer a threat this year. However, we’re seeing huge numbers of people displaced in the current crisis – there are almost three and a half million people who have been forced to flee their homes and take up residence in other parts of Iraq where they don’t have access to facilities, and they don’t have access to the types of resources that they had at home. In many cases people had to flee their homes with only the clothes and what they could carry. So in some areas we’re seeing an increase in malnutrition or micronutrient deficiency. We’re seeing, in some cases, children who are out working and being exposed to higher levels of hazards. The government and humanitarian workers are putting responses in place, but with such as large and prolong crisis, poor access to resources including food, along with the chronic stress of being displaced, is starting to take a toll, especially on the children – they’re much more vulnerable in these circumstances. So UNICEF and partners are trying to monitor growth rates, see if we have acute malnutrition in the form of a wasting, or chronic malnutrition in the form of stunting. And unfortunately, we are starting to see some indication that both of these are happening. So is the danger of cholera gone now? When you have an outbreak in the fall in Iraq, it’s often followed in the spring by a smaller-scale outbreak. So, the agencies and ministries of health were on the lookout for cholera cases this spring, which fortunately, we haven’t really confirmed for this season. April, May are the months that we would expect something to come up if it were to come up. And we’re in May right now and we haven’t had it. We are not out of the woods yet but it’s getting closer to the end of the period where we might see the spring outbreak. However, for the next couple of weeks, we have to maintain vigilance and our surveillance and be able to react and respond very rapidly if we do see an outbreak. Cholera will certainly happen again. So we need to be as ready as we can be to reduce the impact of that is what we’ll strive for. At the end of April, there was an IS terrorist attack which killed almost 20 people. Protesters stormed Iraq’s parliament. How do political tensions affect your work? We anticipate these sorts of things happening, so UNICEF has security measures in place to ensure all of our national and international staff are safe, and hopefully things will remain peaceful. Working in Iraq can be stressful, when you’re working in chronic crisis situations and the need to respond consistently situations which you might not be able to predict. There are a lot of people, nearly 10 million, who need humanitarian assistance, so we have to be in a position to respond to their needs while also keeping ourselves healthy. But people come here knowing that this is a very intense job, and we try to ensure that we monitor staff well-being and see how they’re doing and ensure people get rest as they need. Irak, November 2015. Bereits seit zwei Monaten grassiert die Cholera in der Gegend um Bagdad. Peter Hawkins, Landesdirektor von UNICEF Irak, äußert sich besorgt gegenüber der Nachrichtenagentur Reuters, er befürchtet ein Überspringen der Krankheit auf Nachbarländer wie Kuwait oder Bahrain. Sechs Monate danach sprechen wir mit Jeffrey Bates, Kommunikationschef des UN-Kinderhilfswerks im Irak, über die Gründe für diese Befürchtungen. Surya, der hinduistische Sonnengott, taucht das östliche Ruhrgebiet am 1. Oktober 2015 in ein goldenes Licht. Was an diesem Tag auf einem Kommunalfriedhof in Hamm vonstattengeht, scheint ihm zu gefallen: Priester der Hindu-Gemeinde des Sri-Kamadchi-Ampal-Tempels weihen das erste hinduistische Grabfeld in Mitteleuropa ein. Oberbürgermeister Thomas Hunsteger-Petermann und andere Vertreter der Stadt, Geistliche unterschiedlicher Konfessionen, Wissenschaftler und Journalisten nehmen an der Eröffnungszeremonie teil. Dass Hindus sich überhaupt auf einem Friedhof beisetzen lassen, ist in ihrer Bestattungskultur eigentlich nicht vorgesehen. Wie ist dieser Wandel zu erklären? Wird das Grabfeld bereits genutzt? Und wie fügt es sich in die Geschichte der Hindu-Gemeinde in Hamm ein? Ein halbes Jahr nach der Eröffnung hat Follow Up sich in Westfalen umgesehen. Mehr als 30 Jahre liegen zwischen der ersten Beisetzung auf dem eigenen hinduistischen Grabfeld in Deutschland und den Anfängen der Hammer Hindu-Gemeinde. Deren Beginn reicht zurück bis in die 1980er Jahre. 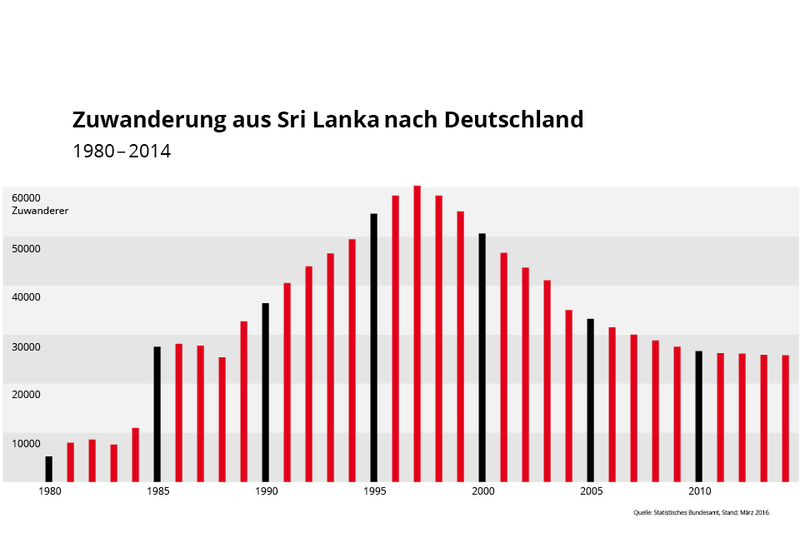 Zu diesem Zeitpunkt wurde in Sri Lanka die Forderung der tamilischen Minderheit nach einem eigenen, unabhängigen Staat immer lauter. Das lag an der zunehmenden Benachteiligung durch die singhalesische Mehrheit. 1983 spitzte sich der Konflikt zum Bürgerkrieg zu, woraufhin viele Tamilen aus dem Land flohen. Knapp 30.000 dieser geflohenen Menschen aus Sri Lanka trafen zwei Jahre später in der Bundesrepublik Deutschland ein. Unter ihnen war auch der Hindu-Priester Sri Arumugam Paskaran. Vor seiner Ankunft 1985 in Hamm hatte Paskaran bereits eine lange Reise hinter sich: von Sri Lanka aus nach Moskau, von dort aus nach West-Berlin. Eigentlich, erzählt er, sei Paris sein Ziel gewesen, „doch der Zug fuhr nicht weiter, sodass ich in Hamm ausgestiegen bin.“ Warum er in der damals rund 170.000 Einwohner zählenden Stadt in Westfalen den Zug verließ, bleibt in seinem Bericht undeutlich. Fest steht jedoch, dass Mitte der 1980er Jahre bereits viele Tamilen Zuflucht in Nordrhein-Westfalen gefunden hatten. Genaue Daten für die einzelnen Bundesländer liegen aus dieser Zeit zwar nicht mehr vor, doch Schätzungen zufolge betrug der Anteil der Tamilen an Rhein und Ruhr mindestens ein Drittel der gesamten Gruppe Geflüchteter, also knapp 10.000 Menschen. Annette Willke, Professorin für Vergleichende Religionswissenschaft an der Universität Münster, geht sogar von noch höheren Zahlen aus. Nordrhein-Westfalen war auch deshalb attraktiv, weil die Einwanderer dort bereits legal arbeiten durften, während das Asylverfahren noch lief. Am 25. Mai 1985 stellte Paskaran den Asylantrag in Hamm. Den Plan, dort eine Hindu-Gemeinde zu gründen, fasste er allerdings erst später: „Eigentlich wollte ich ein, zwei Jahre bleiben, warten, bis der Bürgerkrieg vorbei ist und dann wieder nach Hause gehen“, erzählt der Priester. Doch der Bürgerkrieg hörte nicht auf, nicht nach einem Jahr, nicht nach zwei Jahren, nicht nach drei Jahren – er sollte erst 2009 enden, 26 Jahre nach seinem Beginn. Paskaran blieb in Deutschland, heiratete, bekam Kinder. „1989 habe ich den ersten Tempel gegründet“, sagt Paskaran und meint damit einen Ort für die Andachten, die religiösen Rituale. Denn der „Tempel“ bestand lediglich aus einer Ecke in seiner Wohnung in der Lange Straße im Westen der Stadt. Nach und nach sprach sich unter den hinduistischen Tamilen in Dortmund, Münster, Bochum und anderen Städten in Nordrhein-Westfalen herum, dass es in Hamm einen Priester gibt. So wuchs die Gemeinde mit der Zeit, und der Platz reichte bald nicht mehr aus. Für 50 DM mietete er den etwa 40 Quadratmeter großen Keller des Hauses, doch auch dort wurde es für die Gemeinde bald zu eng. Als nächstes diente eine ehemalige Kegelbahn als Tempelraum. Die Miete von 500 DM bestritt er von seinem Gehalt als Sozialarbeiter und aus Spenden. Am jährlichen Tempelfest und dem feierlichen Umzug nahmen ab 1993 schließlich bis zu dreitausend Gläubige teil. Da der Tempel mitten in einem Wohngebiet lag, traten zwangsläufig Probleme mit den Anwohnern auf: Parkplätze und Toiletten reichten nicht für so viele Menschen, die Nachbarschaft fühlte sich von der Lautstärke gestört und beschwerte sich bei der Stadt. „Bei dem alten Tempel gab es aber auch schlicht und einfach Baumängel“, ergänzt Ulrich Kroker. Der ehemalige Lehrer kam damals mit der Hindu-Gemeinde in Kontakt und vermittelte in der Auseinandersetzung zwischen Hindus, Bürgern und Stadtverwaltung. Heute ist Kroker Mitglied des Tempelbeirats, in dem er gemeinsam mit anderen Freiwilligen die Hindu-Gemeinde bei organisatorischen und juristischen Fragen unterstützt. Als schließlich auch die Medien auf die Hindu-Gemeinde in Hamm aufmerksam wurden, wurde die Stadt selbst aktiv und half bei der Suche nach einem geeigneten Grundstück. Das war bald gefunden, und zwar im Industriegebiet in der Siegenbeckstraße, rund anderthalb Kilometer entfernt vom RWE-Kraftwerk Westfalen. Einiges sprach für diesen Standort: Der Autobahnanschluss erleichterte den Gläubigen die Anreise – inzwischen hatte Hamm sich zu einem zentralen Wallfahrtsort für Hindus aus ganz Europa entwickelt. Auch die Nähe zum Datteln-Hamm-Kanal spielte eine Rolle. Denn Wasser ist für die rituellen Waschzeremonien erforderlich. Es sollte zwar, anders als im Kanal, eigentlich fließen. Doch das sieht die Hindu-Gemeinde mit einer Mischung aus Flexibilität und Pragmatismus offenbar nicht allzu eng. Im Industriegebiet gehörten auch die Lärm- und Parkplatzprobleme der Vergangenheit an. Außerdem war das Grundstück deutlich günstiger als in einem reinen Wohngebiet – kein unwichtiger Faktor für eine Gemeinde, die sich ausschließlich aus Spenden finanziert. Die Randlage außerhalb der Stadt brachte wohl auch Beruhigung in der Auseinandersetzung mit den Anwohnern. Ab dem Frühjahr 1997 fanden die Gottesdienste der Gemeinde in einem kleinen Behelfstempel statt. Das war freilich nur eine Übergangslösung, denn Paskaran plante den Bau eines großen Tempels auf dem größeren, gegenüberliegenden Grundstück. Der Hammer Architekt Heinz-Reiner Eichhorst nahm das ungewöhnliche Bauprojekt schließlich in Angriff und besichtigte dazu einen Tempel im südindischen Kanchipuram, nach dessen Vorbild der neue Tempel im Hammer Industriegebiet gestaltet werden sollte. Die Grundsteinlegung erfolgte im März 2000, die Baukosten von etwa 1,8 Millionen Euro finanzierte die Gemeinde nach und nach aus Spenden und Darlehen. Zwei Jahre später, im Juli 2002, feierten 3.000 Hindus die Einweihung des Sri-Kamadchi-Tempels, des zweitgrößten Hindu-Tempels Europas, mit einem 13-stündigen Fest. 14 Priester aus aller Welt segneten die Tempel-Gottheit Kamadchi, die „Göttin mit den liebenden Augen“, 45 Tage dauerten die Weihe- und Eröffnungsfeierlichkeiten insgesamt. Seither finden im Tempel dreimal täglich Pujas statt. Die Gottesdienste sind öffentlich zugänglich – und zum jährlichen Tempelfest im Sommer kommen etwa 20.000 Hindus und Interessierte aus aller Welt nach Hamm. Am 3. Oktober 2015 bekennt sich Krzysztof Charamsa, Mitarbeiter des Vatikan, öffentlich zu seiner Homosexualität. Den Zeitpunkt für sein Coming-out hat der polnische Theologe bewusst gewählt, beginnt doch einen Tag später, am 4. Oktober, in Rom die Weltbischofssynode mit den Schwerpunktthemen Ehe und Familie. Auch der Umgang der Kirche mit Homosexualität soll dort diskutiert werden. Charamsa ist Dozent an der Päpstlichen Universität Gregoriana in Rom sowie Mitglied der Glaubenskongregation. Die Kirche reagiert prompt und entlässt Charamsa aus allen Ämtern. Der Bischof der polnischen Diözese Pelplin ermahnt den Theologen und fordert ihn auf, zum „Amt Christi“ zurückzukehren. Charamsas Sühne bleibt aus, worauf der polnische Bischof ihn am 17. Oktober 2015 vom Priesteramt suspendiert. Ein halbes Jahr später sprechen wir mit Krzysztof Charamsa über sein Coming-out, die Haltung der katholischen Kirche zur (Homo-)Sexualität – und fragen, wie sich sein Leben in den vergangenen sechs Monaten verändert hat.